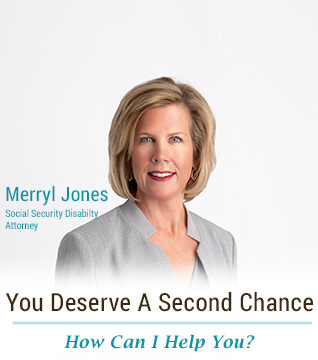 Since 1998, Merryl Jones has given more than a thousand deserving Central Texans a Second Chance to win their Social Security Disability Benefits. She has successfully obtained benefits for 98% of the clients she has represented in the past. While there is no guarantee for the outcome of your case, you can rest assured that Merryl will fight to win you the benefits that you deserve. If you have been denied your Social Security Disability or Supplemental Security Income Benefits, do not give up. Call Attorney Merryl Jones for a free consultation or complete our free on-line case evaluation form. With Merryl, there is never a fee unless she is able to obtain benefits for her clients.